Imagine waking up to the morning sun casting shadows on the island of Molokai and ending your day sipping wine watching the most beautiful sunsets on Earth. Or imagine magnificent rainbows stretching from mountain to sea. This condo is furnished with island rattan and custom art. Master suite upstairs includes a king size bed, TV, and private bath with shower. The second bedroom has a queen size bed as well as a second bath and its own TV. A sofa bed is available in the living room which includes an entertainment center complete with TV and DVD/CD player. The newly remodeled fully-equipped kitchen and furnished lanai are bonuses. Free parking and WiFi are also offered. You can see whales from your lanai during season and see green sea turtles as you walk the shoreline. Evenings are enchanted with the famous Maui sunset shared with fellow guests. If you prefer, you can stroll the grounds or walk to nearby shops and restaurants. A truly Aloha experience. This is a non smoking/ vaping property. Mahalo for your review and for staying with us. Once again, my husband and I had the pleasure of staying in Unit 220 at Polynesian Shores on Maui for an extended stay, this time 11 weeks. The Unit was exceptionally clean and maintained, as it appears most, if not all, of the units at Polynesian Shores are by the looks of the hard working cleaning crews. The owners, Rich and Joan, were the best we have ever encountered. As an example, my husband has a sensitive back due to war injuries in Vietnam. He was not adjusting well to the king mattress and mentioned this to Bree in the office. Within a very short time, a matter of hours, Bree talked to the owners and a new mattress was on its way. Just one of many thoughtful gestures made by Polynesian Shores and Rich and Joan. I would recommend this property in a heartbeat. It's right on the ocean and very close to the basics if you choose not to rent a vehicle. If you do have vehicle, Lahaina with all of its restaurants and activities is about 10 minutes away. There are numerous restaurants in the area to fit any budget and palate. There are many places to walk in the area and several yoga studios and fitness centers about 10 minutes away. In addition to the whale watching from your lanai, there are excursions to do so, as well as zip lining, Road to Hana and Haleakala. There are way too many excursions to mention here, but there's something for everyone, if you desire, or you can sit on the lanai and enjoy the cool ocean breezes. Aloha Gina, Many mahalos for taking the time to let us know about your stay. We thoroughly enjoy having you as our guests and look forward to next winter for your return! Great experience! Fantastic location. Amazing view! Felt like our home away from home. We look forward to your return to stay with us! We stayed in rental #220 in early November 2017. We arrived after the office was closed but that wasn't a problem. They had an easy process in place for us to get our keys. The condo was clean and stocked. We loved the fruit basket that welcomed us. The condo is exactly like the pictures and we felt like we got what we booked. There were no surprises. The view from the lanai was stunning and we enjoyed the sunset views in the evening. The resort residents were extremely nice and helpful. The best part of the condo is the location. We were close to everything and the condo beach was awesome. Our kids were able to go snorkeling with sea turtles and explore the tide pools. We definitely plan to go back! Aloha, We are so pleased to hear that you and your family enjoyed your stay. We look forward to your return in the future! Polynesian Shores is the place to be! Polynesian Shores is one of those special places in the world where you can "get away from it all," or you can take a short drive and be in the "heart of it all!" 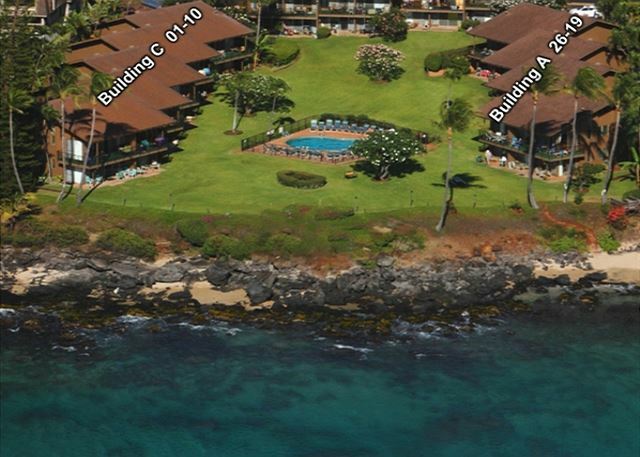 The location in West Maui provides easy access to both quiet beaches or the night-life in Kaanapali or downtown Lahaina. We've not seen a better spot for sunset either. Every night the sun drops into the Pacific between Lanai and Molokai. Polynesian Shores truly sits on one of the most beautiful spots on the planet. A treasured location on the most beautiful island in the world - Maui. Ahhh.... sounds like a wonderful trip. We look forward to your next visit. Mahalo for staying with us! Sounds perfect. So glad to hear you enjoyed your stay with us! See you next time! We've stayed many times at Polynesian Shores and love it! This trip we rented two units for our family. I do think there needs to be a better access to the beach, it was fine for our group, but anyone with mobility issues would not be able to get to this beach, it has been better in the past. It was awesome having you stay with us! See you next time! Condo was great and perfect for our family of 5 with 2 kids on the fold out. Sunset views were amazing! We wanted to be right there for every sunset. I was worried the pool would be too small but the kids loved it especially b/c it had a true "deep end" that you don't see in pools much these days. Snorkeling there was top notch and even snorkeled with my 5 year old daughter. Tons of turtles and we snorkeled along right with them. Good local shops, restaurants and amenities and I highly recommend going to the "fish market" just a few blocks south, having them prepare you fish, and grilling out at the unit one night. The location makes this this whole condominium division a little slice of heaven! Aloha! We are so pleased that you enjoyed your stay with us and enjoyed our beautiful location here in West Maui. We hope to see you next time you visit our beautiful island! Although the units are old, this one's kitchen area was recently renovated so it felt modern inside. Nice ocean view. The only drawback to the location is how far it is to many of the places we went. Otherwise, great place to stay. We look forward to the next time you use those "tickets to paradise!" Great place to stay! love the pool perfect for family's! We enjoyed your visit and hope to see you next time you visit Maui! Loved the condo - perfect for our family! Comfy accommodations, lovely grounds and pool, and so close to the beach. We had a terrific week. Our kids loved being able to walk over to the pool anytime they wanted, we snorkeled off the beach, and enjoyed the sea breezes. Totally convenient to the farmer's market and other nearby shops. Great location. Friendly staff. Will definitely visit again. We look forward to your return and are pleased to know you enjoyed your stay! Great facility, lots of turtles on the beach, small beach very close to the resort, good little pool, good management. Each condo is privately owned and differently remodeled. Some are more basic and some are more modern. The resort was great and had a wonderful stay. Watching the turtles at the beach by the resort was a highlight. Would recommend this resort. I couple of pointers, I would recommend getting a unit that was not right beside the parking area as that did tend to be a bit noisy. The other point to be aware of is that the resort is in the rain shadow of the mountain so the resort does get more rain than Lahaina. Great spot right on the shore with whales, turtles and paddle surfers in view. My husband and I and our daughter and son-in-law rented for a week in October. Beautiful location: we saw turtles right off the property, snorkeled with them, barbqued, enjoyed sunsets, pool, swam at area beaches, and enjoyed the neighborhood. Very comfortable family environment. Warm and humid several nights due to tropical storms pulling the trade winds away, but the winds came back the last couple days. Fans really helped! Loved the chatter of birds in the morning, rain a couple of times, and lovely gardens. This was a perfect Hawaiian get away. We felt like we couldn't have asked for a better location. Seeing the turtles everyday was icing on the cake! We enjoyed having you. See you next time! Mahalo for staying at Polynesian Shores! Rental condo fully met our expectations and needs. Great quiet location. View whales and sea turtles from lanai. Walking distance to beach (or drive up to beach lot), Farmers Market Maui (organic market with the best smoothies, soup bar and hot food bar and Mon Wed Fri outdoor farmers market with lots of samples), coffee shop, and more. The residents in the condo community are friendly and helpful (sunset happy hours are good time to meet them and find out local info), however, I don't recommend this condo community for children (the residents like their quiet and I cannot blame them. My three older teens rarely used the small pool because of the screaming children). Washer/dryer facility was great. Fully equipped kitchen that saved me money by preparing meals most days. Beach chairs and boogie board (bring your own beach towels). Fans to keep you cool. Cable tv and wifi access. Although the condo fit our needs, it could use a little updating (particularly the bathrooms, shower doors and sliding glass door to lanai are old and not easy to open/close, the sleeper couch mattress is uncomfortable). But, I would absolutely return. It was relaxing and very enjoyable. We stayed with friends in condo 220. It was beautiful and breathtaking in all aspects. We really enjoyed our stay in The Polynesian Shores and we will suggest this place to anyone who will be travelling to Maui. This location is excellent and the view is spectacular. The management of the complex could not have been more hospitable. Juile and her team were wonderful and she provided us with all the necessary information that we were looking for. We want to take this opportunity to thank the Polynesian Shores for having us and we will return again. Mahalo for everything.